What Is a 3(38) Fiduciary Service Provider? A 3(38) fiduciary service provider is an entity that will operate as an investment manager within the definition of ERISA Section 3(38). The investment manager is given full discretionary authority and control for making investment decisions for a retirement plan. The plan sponsor is still responsible for ensuring that the investment manager is fulfilling its contractual obligations, but the plan sponsor is not responsible for any of the investment decisions. A 3(38) fiduciary service provider must be a registered investment adviser, bank, or insurance company. Further, the provider must acknowledge its fiduciary status in writing. Make sense? Now, on to the benefits. When plan sponsors choose to outsource their investment oversight, a 3(38) fiduciary service provider will assume discretionary control over all plan-related investment decisions. This delegation can significantly reduce the plan sponsors’ fiduciary responsibility—freeing them of the burden of making investment decisions and giving them time to focus on running their business. Scale your business. With a 3(38) fiduciary service provider in place, you no longer need to monitor investment selections, perform investment due diligence, or make recommendations. This will allow you to spend more time on programs to educate employees and encourage plan participation. Serve additional market segments. Through the scale offered by outsourced investment oversight, you will have more flexibility to take on additional business. In turn, this flexibility will provide the opportunity for you to consider serving additional plans in multiple market segments. Position yourself as a valued partner. When you help facilitate your clients’ decision to outsource their investment oversight, you can position yourself as a valued partner—the “hero” who freed them from the stress and time spent on investment decisions. In addition to the benefits, there are other factors you should consider when choosing the right 3(38) fiduciary service provider. Of course, you will want a service provider that is reputable, prudent, and sophisticated. But, equally as important, you will want to consider how the service provider will work with you as the plan’s advisor. Here, it’s important to keep in mind that third-party 3(38) fiduciary service providers are retained to serve plan sponsors and their plans, not the plan advisor. So, while a third-party 3(38) service provider may not proactively put the plan’s advisor in a negative position, there is no incentive for the provider to make the plan’s advisor look good. As such, for you to truly reap the benefits of your clients’ adoption of a 3(38) service provider, that provider should ideally be one you already know and trust. As you evaluate this potential partnership, it might help to ask yourself the following questions. Do you have an existing relationship with the 3(38) fiduciary service provider? When you have an existing relationship with a provider, you should have a good understanding of the services it provides and what the client experience will be like. This familiarity adds value for your clients, as you will be able to help them establish expectations and navigate the ongoing services. The existing relationship will also provide insight into what your own experience will be like. Will the 3(38) provider answer your phone calls? Respond to your e-mails? Answer your questions in a timely manner? If the answer to any of these questions is “no,” then the potential struggles of that relationship may outweigh the benefits. Does the 3(38) fiduciary service provider want a partnership with the plan advisor? A strong partnership requires trust between the two parties. Each party should be considerate of the other when taking action and seek to include the other where appropriate. This aspect of coordination is important. You want a 3(38) provider that will provide you with insight into its processes and decisions. This will put you in a position where you can provide answers in a timely manner and help your clients monitor the 3(38) provider's activities. 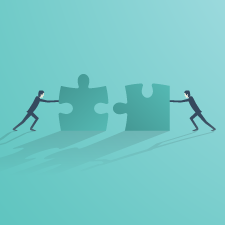 A strong partnership between the 3(38) provider and the plan advisor is a benefit to the client, allowing for a more focused investment oversight outsourcing experience. And I'm speaking from experience! As a 3(38) fiduciary service provider, Commonwealth offers a solution that our affiliated advisors can trust. We are able to coordinate with them at a high level given our established relationship; in turn, our advisors know they can connect with us at any time. The guidelines discussed here will provide a great starting point as you explore your 3(38) fiduciary service provider options. Of course, deciding on a service provider will take time and effort, and you may want to explore viable in-house solutions. But, in the end, the right partnership can save you time while also helping you grow your retirement plan business. Do you have existing relationships with 3(38) fiduciary service providers? What other benefits do you see from this partnership? Please share your thoughts with us below!